The pool will be open for swimming this Monday, May 26 (Memorial Day), so that residents can enjoy the holiday with their families. Therefore, it will be closed for cleaning from 8 am – 5 pm on Tuesday, May 27. Regular hours will resume on Wednesday, 5/28. We’re changing things up a bit this year and hosting a “Movie at the Pool” at dusk (around 8:30 pm) on Saturday, June 7. Join us for a screening of “Frozen” along with beverages and snow cones. 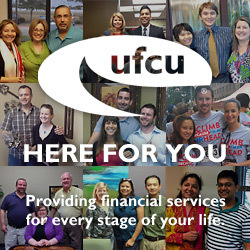 Many thanks to University Federal Credit Union for their generous sponsorship of this event! See you there! The annual meeting of the Scofield Residential Owners’ Association will be held on Tuesday, May 20th at 7 pm at the Frank Fickett Boy Scout Center, 12500 North I-35, Austin TX 78753. Check-in will begin at 6:30 pm. The agenda for the meeting is available here. Please join us for an important update on the past year from your Scofield ROA Board of Directors, as well as the election of three members to the Board. We’ll also be giving away door prizes. The annual meeting is not only a informative and fun event, but necessary to the operation of our homeowners’ association. If you are unable to attend, please complete your proxy form and return to Certified Management of Austin’s office by May 19, 2014, or you may send it with a neighbor who is attending. Your signed proxy will help meet the required quorum of ten (10%) percent. Hope to see you all on the 20th! Join us at the pool from 2:30 – 4:30 pm on Saturday, May 10 for some classical music! Sarah Jane Hargis, flutist, and Steven Paul Haskin, guitarist, who perform together as Austin Flute and Guitar, will be sharing their talents with us. Refreshments will be provided. For more information, visit their website at austinfluteandguitar.com.